University of Pittsburgh Press, 9780822965572, 72pp. CEASE begins with the words, “to keep the peace/we need a wall/to fall to our knees before….” Framed by the long poem, “wall,” Beth Bachmann’s new collection of poetry wildly upturns the boundaries between bodies at peace and bodies at war, between the human territory of border walls and the effects of war on the environment and landscape, between the movements of soldiers and of refugees, between terror as an interior state and violences performed on the body, and between the words of politicians and the breath of a poem. 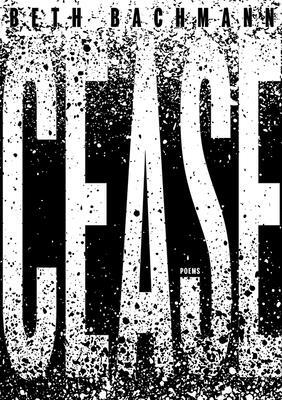 Taking up Muriel Rukeyser’s call for women poets to respond to war, “Women and poets see the truth arrive,” the poems in CEASE are almost breathless in their speed and presence on the page. CEASE is both a plea and an awakening to peace as a process and a transient state. Beth Bachmann is a 2016 Guggenheim Fellow in poetry and the author of two prior books from the Pitt Poetry Series: Temper, winner of the AWP Donald Hall Prize and Kate Tufts Discovery Award, and Do Not Rise, winner of the Poetry Society of America’s Alice Fay di Castagnola Award. Poems from CEASE received the Virginia Quarterly Review Emily Clark Balch Prize. Each fall, Bachmann serves as Writer in Residence in the MFA program at Vanderbilt University.